Our adults ‘make a movie’ course has proved very successful so far, and it is the perfect opportunity to gain a broad understanding of what is involved in making a film, from script to screen. The course runs for 5 days from 10am – 4pm in Dublin city centre and costs €400 – this includes all materials. Places on the course are limited to 10 per class to ensure maximum immersion with the equipment etc for each participant. 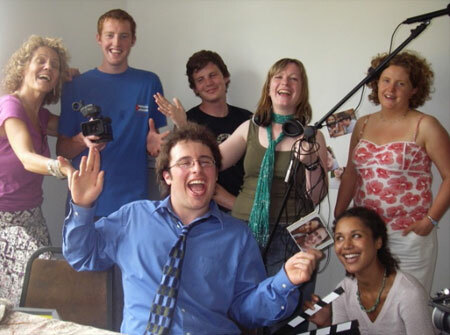 The course content covers in 5 days what other part time filmmaking courses cover in 8-10 weeks – so it is definitely an intensive and comprehensive introduction to filmmaking. The course is aimed at beginners or people with a theoretical knowledge of film, as opposed to technical experience. Each day is structured with a variety of creative work alongside technical workshops in camera, lighting and sound recording. The adults course also includes guest lectures from heavily experienced industry professionals. Throughout the 5 days, students will collaborate as a group to write, direct and edit their own short film using industry professional kits and Final Cut Pro HD software. Upon completion of the course, participants receive the film on DVD and we promote it at a screening and various film festivals. The course is not designed to educate and prepare participants for a career in filmmaking immediately after completion – it merely allows participants to discover what aspects of filmmaking they enjoy most, so that they can develop these skills further on their own or at third level. The fee for the course is €400 and this is based on the equipment used, the guest lectures and this cost is on par with similar 10 week filmmaking courses available around Dublin. Please contact us if you require further information on our adults filmmaking course.